In our Wurlitzer there are 7 ranks made up by 511 pipes. 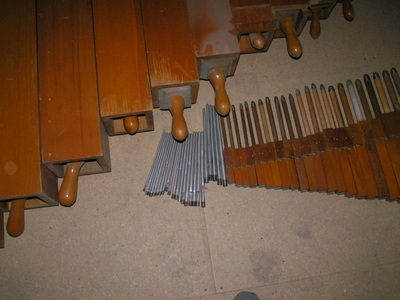 These are Tibia Clausa, Bourdon/Flute, Diaphone/Diapason, Violin, Violin Celeste, Vox Humana and Trumpet. The wooden pipes, Tibia och Flute, were in good condition. 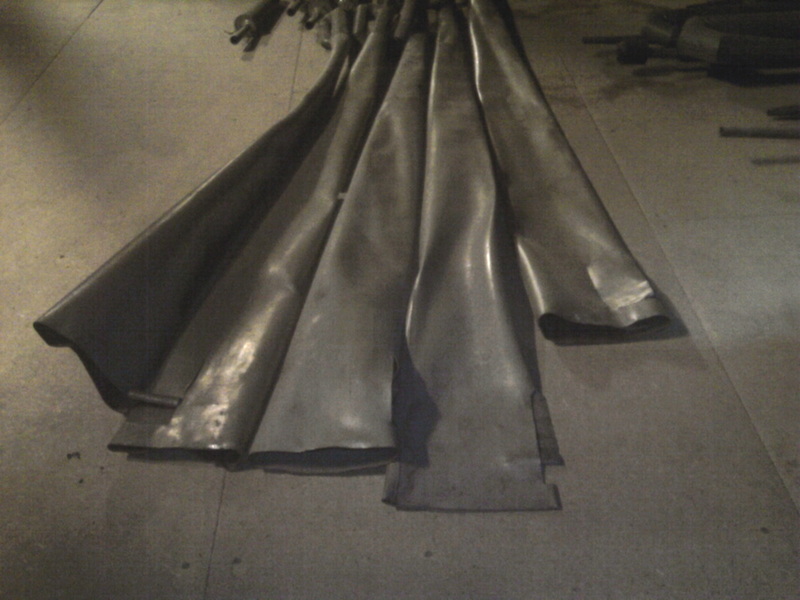 Defects were mostly cosmetic. 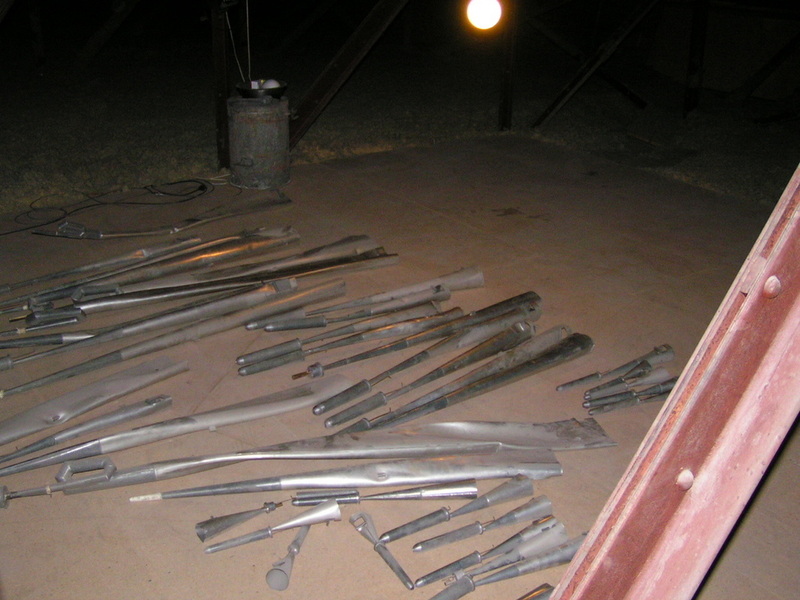 Many of the metal pipes were in a miserable condition, especially the Trumpets. Many of the delicate Violin pipes were bent and nicked. Here are some examples (pictures are clickable for better resolution). 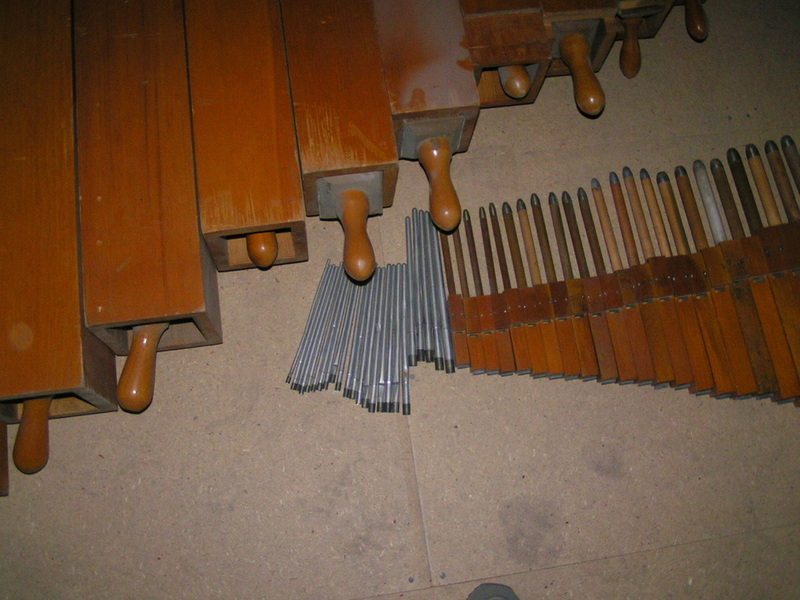 During the inventory we found that one pipe was missing, it was the top C (#61) in the Vox Humana rank. We decided to go on without this pipe. Later a newly made Wurlitzer copy of the Vox Humana top C was donated by Mr. William Mollema. Trumpet in very bad shape. Violin pipes. These are delicate and are easily bent..
Flute. In good condition, also the small metal ones. Closeup of some Trumpets. 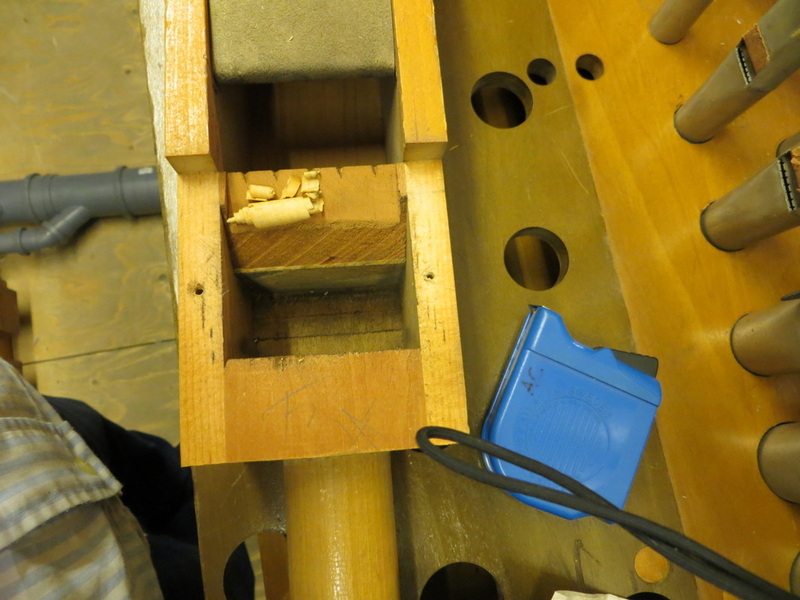 Our expert, Magnus Blix from organ builder Åkerman & Lund said that he could fix them. After many hours the result can be seen in the picture to the right. Like new! This Tibia didn't sound OK. An investigation found this. I wonder where these things came from. 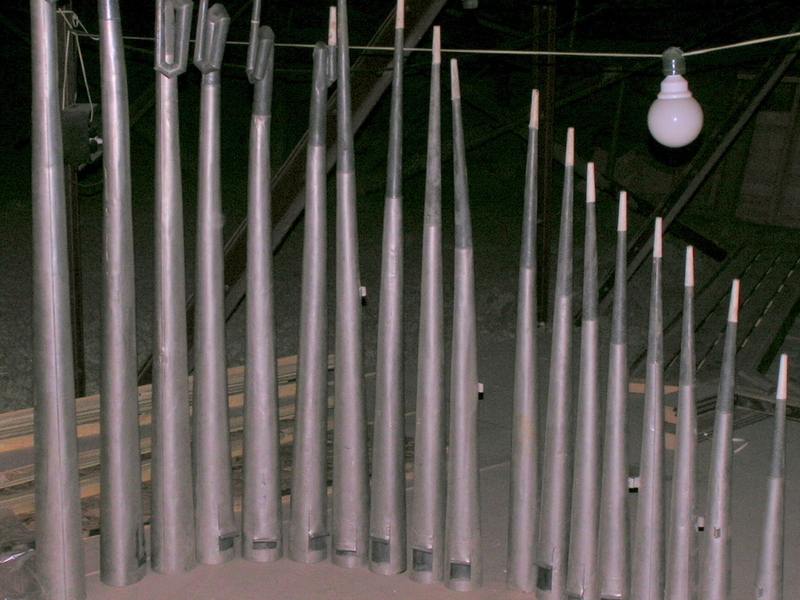 All pipes were kept in the City Hall attic until it was time to install them in the organ. Here pipes and some other stuff were packed in proper boxes and awaiting transport. 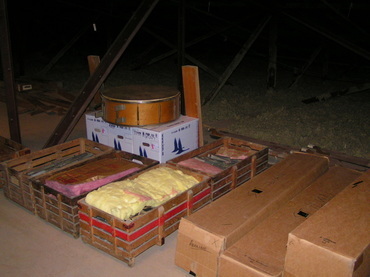 It has always been difficult to move parts from the City Hall attic. 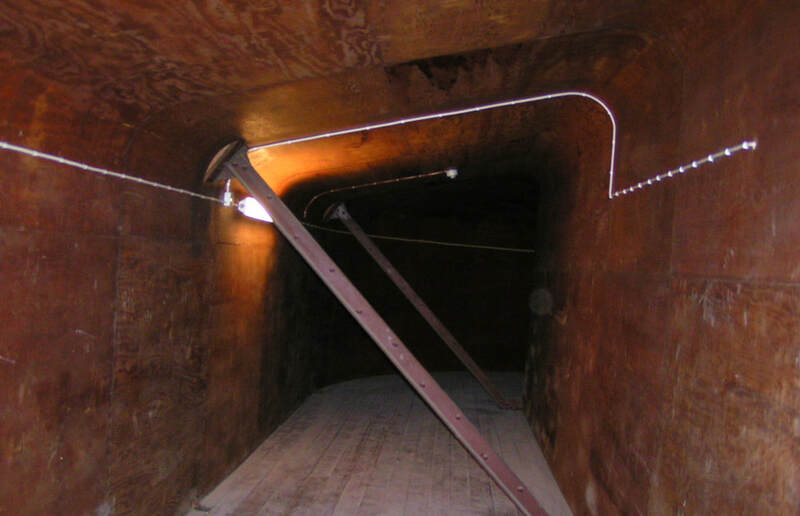 This time we could use a shortcut through the kitchen which occupies part of the attic and use an elevator straight to the street level. This was in December just after the Nobel Prize banquet which takes place in the City Hall (food prepared in this very kitchen). Dusty old pipes through a fancy kitchen? The reason we could use this was that no food will be prepared here any more. The kitchen is up for a total rebuild. 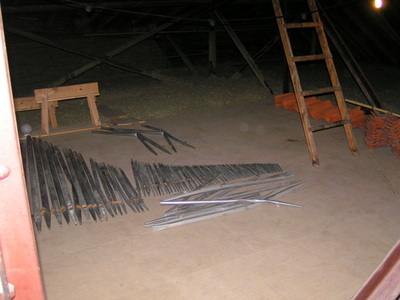 Organ pipes in the City Hall kitchen on their way to new adventures. Now the acoustic tunnel is empty, so good bye City Hall. Below are two images, "before" and "after".